Dramatic aerial photos show the destruction left behind. From the massive flooding in Houston to the demolished homes in Rockport, these aerial photos provide a bird's-eye view of the destruction left behind in Texas by Hurricane Harvey. Harvey has caused at least 19 deaths, led to more than 13,000 rescues and left thousands displaced from their homes. Over 10,000 came to a shelter at downtown Houston's George R. Brown Convention Center -- over double its capacity. 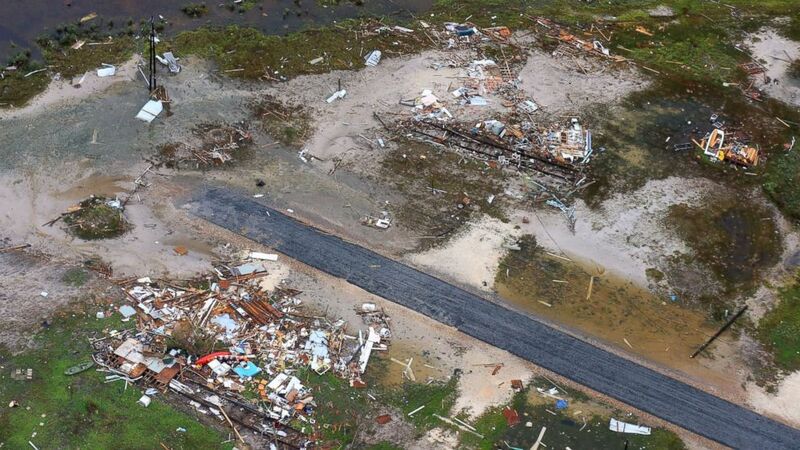 The storm created a new record for total rainfall from a tropical system in the continental U.S. -- 51.88 inches of rain was reported at the Cedar Bayou on the Texas coast, preliminary data shows. 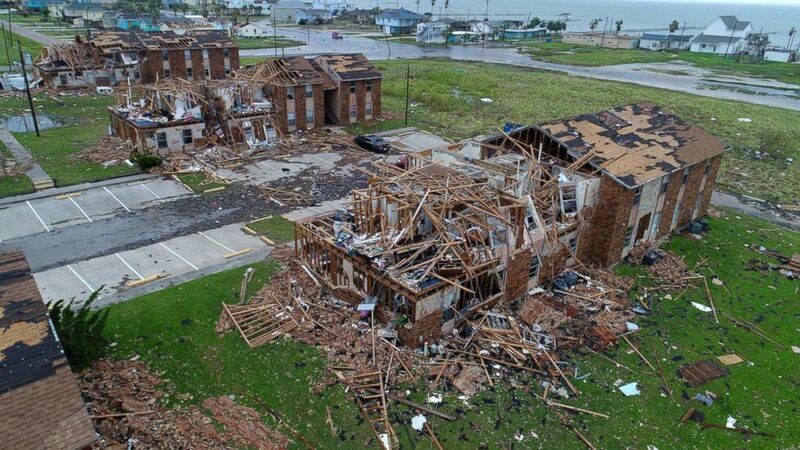 In the coastal city of Rockport, wind gusts from Harvey reached 108 miles per hour, demolishing apartment buildings and mobile homes, and killing at least one person. 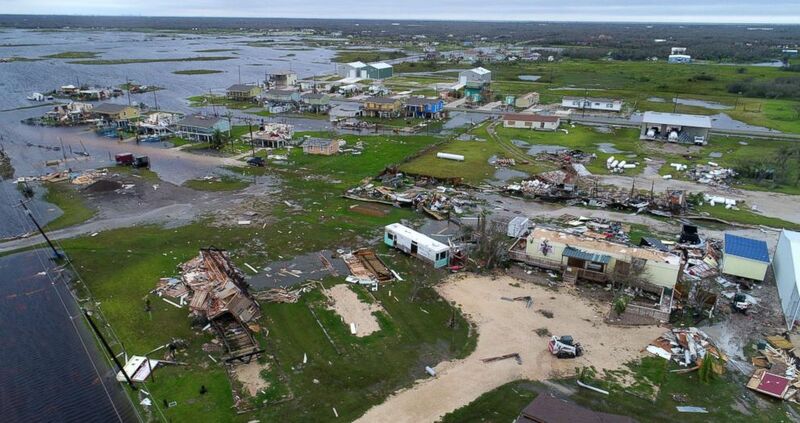 (Courtney Sacco and Matt Woolbright/Caller-Times via USA Today Network) Buildings and mobile homes destroyed by Hurricane Harvey in Rockport, Texas, Aug. 27,. 2017. (Courtney Sacco and Matt Woolbright/Caller-Times/USAToday Network) An aerial image shows the remains of the Salt Grass Landing Apartments in Rockport, Texas after Hurricane Harvey, Aug. 27, 2017. The city saw 6.23 inches of rain. 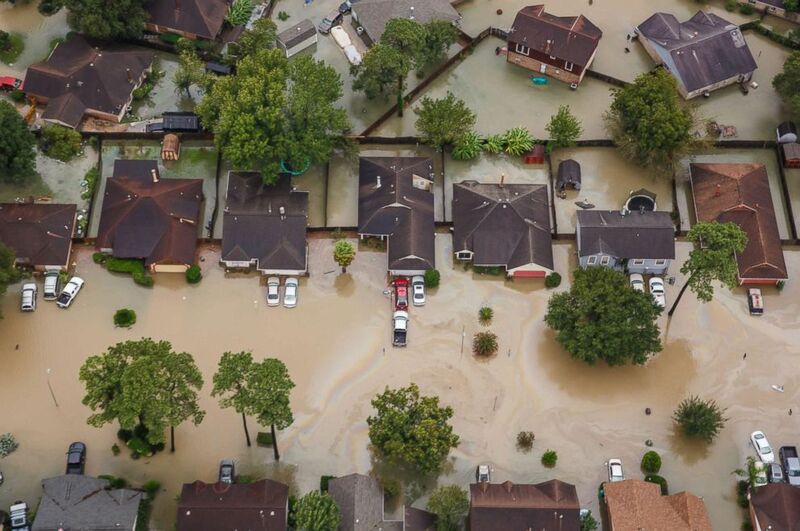 Houston, the nation's fourth largest city, received 31.26 inches of rain, which flooded roads, airports and homes, and submerged vehicles and forced evacuations. 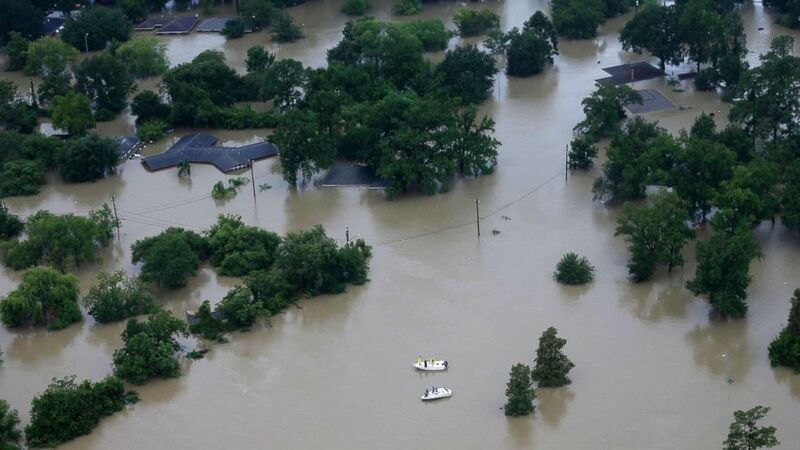 At least five people, including a police officer, died in the Houston area. (David J. Phillip/AP) Boaters pass through a neighborhood that has been covered by floodwaters from Tropical Storm Harvey, Aug. 29, 2017, in Houston. 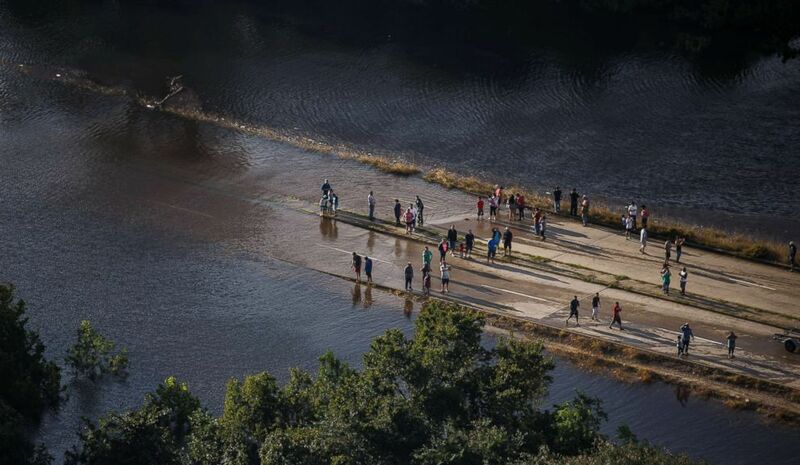 (Marcus Yam/Los Angeles Times via Polaris) People venture out to see the flooded areas near their homes in Houston, Aug. 29, 2017. 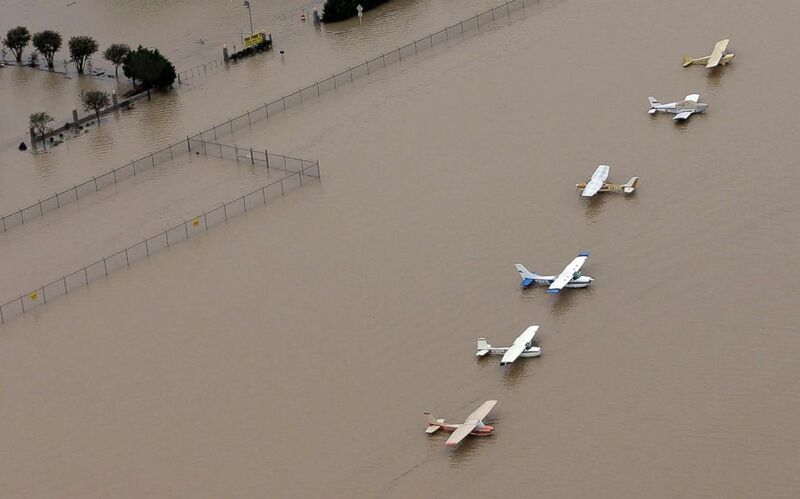 (David J. Phillip/AP) Airplanes sit at a flooded airport near the Addicks Reservoir as floodwaters from Tropical Storm Harvey rise, Aug. 29, 2017, in Houston, Texas. 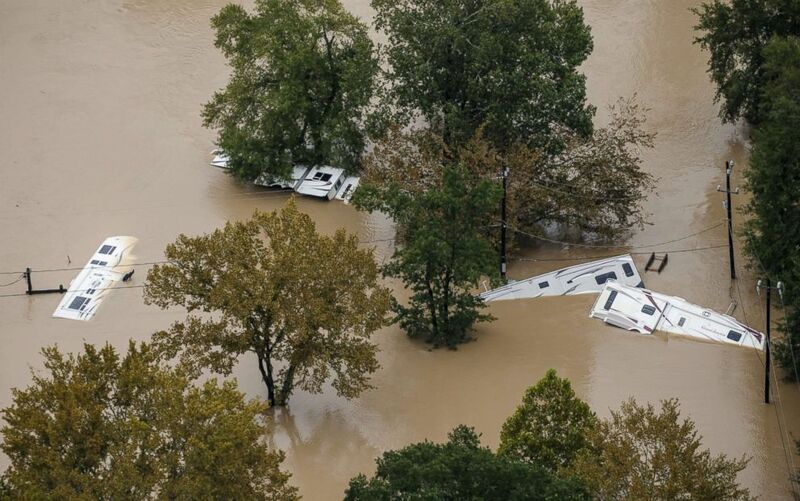 (Marcus Yam/Los Angeles Times via Polaris) Recreational vehicles are submerged in floodwaters following Hurricane Harvey, Aug. 29, 2017, in Houston, Texas. 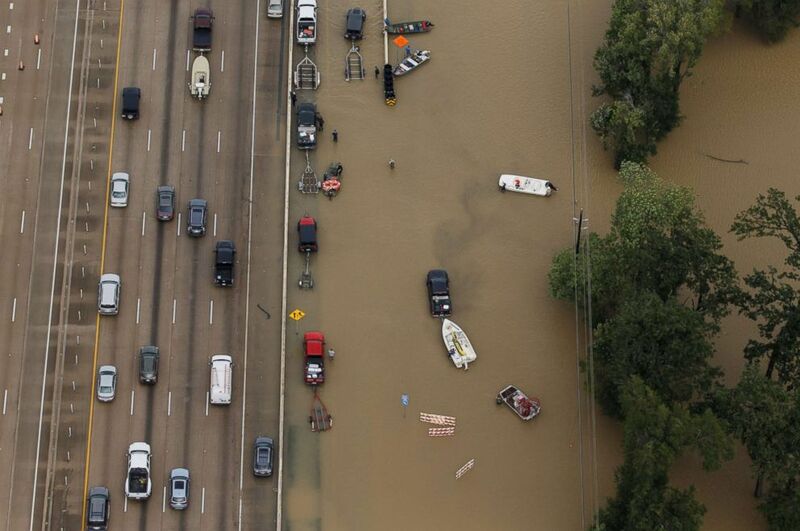 (Marcus Yam/Los Angeles Times via Polaris) Vehicles sit on Interstate 10 which was closed due to high water, as volunteers launch rescue boats into the flooded waters, Aug. 29, 2017, in Houston, Texas. (Marcus Yam/Los Angeles Times via Polaris) A residential neighborhoods is inundated with floodwater in the wake of Hurricane Harvey in Houston, Aug. 29, 2017. 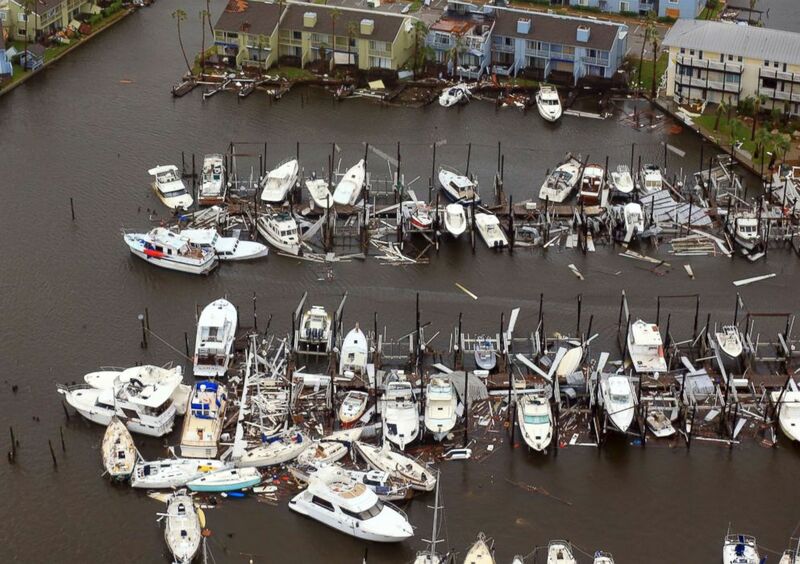 In coastal Corpus Christi, Texas, wind gusts reached 65 miles per hour, destroying buildings and damaging boats. (Gabe Hernandez/Corpus Christi Caller-Times via AP) Debris left behind in the wake of Hurricane Harvey, Aug. 28, 2017, in Corpus Christi, Texas. (Gabe Hernandez/Corpus Christi Caller-Times via AP) Damaged boats left in the wake of Hurricane Harvey, Aug. 28, 2017, in Corpus Christi, Texas. 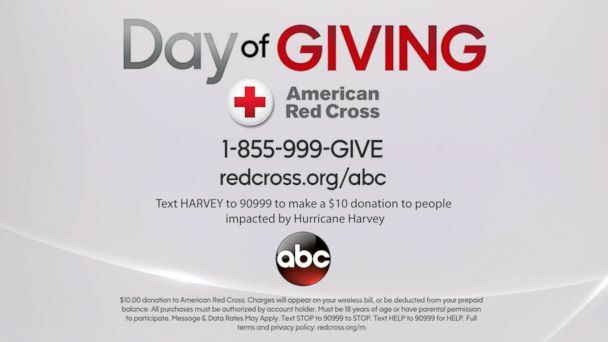 Take part in Disney's Day of Giving: To support people impacted by Hurricane Harvey, call 1-855-999-GIVE, donate at www.RedCross.org/ABC or text "HARVEY" to 90999 to make a $10 donation. ABC News' Phaedra Singelis, Melissa Griffin, Daniel Peck and Elizabeth Morringello contributed to this report.